Once you’ve decided what dog door properties are important to you – for instance weather proofing, a low level of maintenance, low cost up-front or low cost long-term – it’s a good idea to weigh and measure your dog. That way you have something to compare to the desired manufacturer’s size charts. The opening width should be a little wider than your German Shepherd – so it’s easy to get through without getting stuck on the edges. Measure your dog’s height. You need two measurements: the top of the shoulder and the bottom of the chest. The easiest way to measure a dog is calling them to stand next to you and marking the height on your own leg. If you’re still uncertain, cut the door’s opening size in a piece of cardboard. 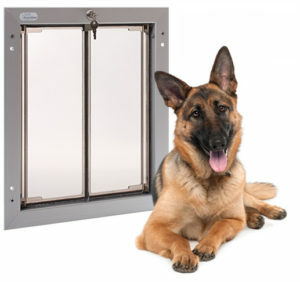 If your pet can go through the hole in the cardboard without problems, they will be able to get through the pet door. When it comes to the PlexiDor, German Shepherds require a large door.